How was human genetics shaped by early human migrations? Figure 1. Proposed migration patterns out of Africa for modern humans. Early anatomically modern human evolved in Africa, possibly east Africa, at least 200,000 years ago. However, recent finds suggest this might be older. Population bottlenecks, or a reduction in population size, resulted in a relatively less genetically diverse population that would eventually influence all human populations today. Migration out of Africa ensured that the genetic makeup began to be less diverse as humans migrated to other regions and continents. Population bottlenecks often reduce genetic diversity, as a large reduction in population means that subsequent populations will inherit that more limited gene pool. Although modern humans evolved perhaps more than 200,000 years ago, as late as between 80,000-70,000 years ago, a population bottleneck has been proposed for modern humans. There is evidence of major climatic change at around this time, perhaps triggered by a super volcanic eruption activity in Lake Toba, Indonesia, that led to rapid global cooling. Some have suggested that this was the key even that resulted in a more limited gene pool for modern humans. Others have disputed this finding, and have suggested that the bottleneck may have been triggered much earlier, at about 100,000 years ago or more. Other work has suggested perhaps by 100,000 years ago variations in modern humans became less, as a limited population began to influence the genetic makeup of many other subsequent human populations. Where there is greater diversity, it is found in Africa itself, where different modern African populations show far greater genetic diversity than the rest of modern human populations in all other regions of the globe. Human in general are much less genetically diverse than many other types of animals. Overall, this lack of diversity has suggested a limited number of humans may have been responsible for the variety of populations today, suggesting relatively small numbers, or even population bottlenecks, shaped the population of areas outside of Africa. The relatively greater genetic diversity in Africa suggests humans were evolving like many other species in Africa, creating new populations over time. Climatic effects or crises may have then triggered a large-scale migration out of Africa that subsequently led to the more narrow genetic diversity found today in other regions. Scientists do not completely agree on all the genetic and archaeological data, but there may have been two main migrations from Africa (Figure 1). The first may have been relatively small and it may have occurred more than 140,000 years ago. This migration could have resulted in population spreading to West and East Asia, as far as Indonesia. However, the second main migration, between 80,000-50,000 years ago, seems to have been far more significant. In fact, nearly 98% of human genetics found in many global populations appear to trace their genetics to this second migration. In effect, this might have meant that the first migration may not have been successful or it resulted in a more limited population in different regions outside of Africa. The second migration, which could have consisted of several sub-migrations over the span of time, seemed to spread far and more rapidly across the globe. During this last great wave from Africa, it is during this time we see the rapid spread of modern humans on the Earth. Cro-Magnon are generally considered the first anatomically modern humans in Europe at about 50,000 years ago. Already nearly 1 million years ago, the earliest Homo species had migrated to Europe, likely via Eurasia. As modern humans expanded in Europe and Asia, they increasingly came across Neanderthals. At this point, humans were most likely competing with Neanderthals for resources and food. At times, the two species were similar enough to breed, which has resulted in some genetic makeup of modern humans having Neanderthal DNA (some populations range in having 1% to 4% influence in DNA from Neanderthals), but this seems to have been relatively limited. By 30,000 years ago, Neanderthals had largely disappeared as a distinct sub-species of humans. In east Asia, east Siberia, Korea, and Japan, modern humans may have been reached these areas by 35,000 years ago. This population that migrated to these regions also led to a sub-population that became the first colonizers of the Americas. It is not clear when, but between 40,000-16,500 years ago, modern humans migrated over the Beringia land bridge, connecting North America with East Asia in Russia and Alaska today, likely using the ice sheets that formed in the late glacial maximum period when ice sheets and glaciers covered many parts of North America. Recent genetic work has shown that human populations in the Amazon are genetically similar to Australoid populations, or populations that also migrated to east Asia and Australia. In effect, human migrations to the Americas likely traveled along the coastal regions between North and South America. Figure 2. 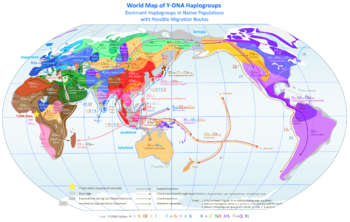 Map of Y-DNA Haplogroups and the origin of genetic Adam. As stated, for most human populations, the vast majority of it can be traced to a large wave of migrations that occurred between 80-50 thousand years ago. Overall, humans are about 99.5% similar to each other, suggesting that relatively few populations have influenced the vast majority of our genetic makeup. In Africa, using linguistic and genetic evidence, there were likely about 14 main population groups. These groups show a wider range of genetic variability due to founder effects and isolation of very early humans that evolved over 200,000 years ago (Figure 2). Modern African populations in eastern Africa, between Namibia and South Africa, are likely the most similar to other human populations found in other parts of the world, which suggests that it was this region that modern humans began the large, second wave migration that eventually colonized the rest of the planet. Genetic variation among modern humans is relatively limited to most species found on Earth. Populations within Africa were often isolated, developing more diverse genetic variation over time. Once populations left Africa, that diversity began to diminish. Despite physical traits that show variety among humans today in wide regions, the fact is most of those populations show very similar genetic makeup with some input from much older hominid populations and some early modern humans who migrated before the great migration that occurred between 80-50 thousand years ago. In effect, since about 80,000 years ago, humans became far more mobile, whereas migration was very limited perhaps for more than 100,000 years in the evolution of Homo sapiens. The next great divergence between migratory human populations occurred at about 40,000 years ago, where part of the populations migrated towards Europe and the other part into east Asia and eventually North and South America. ↑ For more on the recent debate, see: Lane, C.S., Chorn, B.T. & Johnson, T.C. (2013) Ash from the Toba supereruption in Lake Malawi shows no volcanic winter in East Africa at 75 ka. Proceedings of the National Academy of Sciences. [Online] 110 (20), 8025–8029. Available from: doi:10.1073/pnas.1301474110. ↑ For more on population bottleneck events that may have shaped how human genetics evolved, see: Cochran, G. & Harpending, H. (2009) The 10,000 year explosion: how civilization accelerated human evolution. New York, Basic Books. ↑ For more on African genetic diversity, see: Campbell, M.C. & Tishkoff, S.A. (2008) African Genetic Diversity: Implications for Human Demographic History, Modern Human Origins, and Complex Disease Mapping. Annual Review of Genomics and Human Genetics. [Online] 9 (1), 403–433. ↑ For more on the main migrations out of Africa, see: Hans-Jürgen Bandelt, Vincent Macaulay, & Martin Richards (eds.) (2006) Human mitochondrial DNA and the evolution of homo sapiens. Nucleic acids and molecular biology 18. Berlin ; New York, Springer, pg. 235. ↑ For more on migration into Eurasia, see: Semino, O. (2000) The Genetic Legacy of Paleolithic Homo sapiens sapiens in Extant Europeans: A Y Chromosome Perspective. Science [Online] 290 (5494), 1155–1159. Available from: doi:10.1126/science.290.5494.1155. ↑ For more on migrations in east Asia, see: Su, B., Xiao, J., Underhill, P., Deka, R., et al. (1999) Y-Chromosome Evidence for a Northward Migration of Modern Humans into Eastern Asia during the Last Ice Age. The American Journal of Human Genetics. [Online] 65 (6), 1718–1724. ; for migrations in the Americas, see: Hey, J. (2005) On the Number of New World Founders: A Population Genetic Portrait of the Peopling of the Americas Andy G. Clark (ed.). PLoS Biology. [Online] 3 (6), e193. Available from: doi:10.1371/journal.pbio.0030193. ↑ For more on genetic Adam and Eve, see: Callaway, E. (2013) Genetic Adam and Eve did not live too far apart in time. Nature. [Online] Available from: doi:10.1038/nature.2013.13478 [Accessed: 12 June 2017]. ↑ For more on the great migration that have subsequently influenced human populations, see: Yotova, V., Lefebvre, J.-F., Moreau, C., Gbeha, E., et al. (2011) An X-Linked Haplotype of Neandertal Origin Is Present Among All Non-African Populations. Molecular Biology and Evolution. 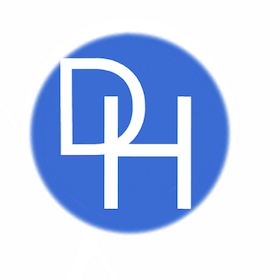 [Online] 28 (7), 1957–1962. Available from: doi:10.1093/molbev/msr024. ↑ For more on post-Africa migration genetic divergence, see: Barbujani, G. & Bertorelle, G. (2001) Genetics and the population history of Europe. Proceedings of the National Academy of Sciences. [Online] 98 (1), 22–25. Available from: doi:10.1073/pnas.98.1.22.